The Tarim Basin is an endorheic basin in northwast Cheenae occupyin an aurie o aboot 906,500 km2 (350,000 sq mi). 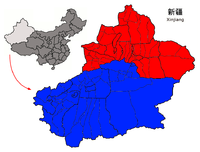 Located in Cheenae's Xinjiang region, it is sometimes uised metonymously for the soothren hauf o the province, or Nanjiang (Turkis: tarım havzası, Cheenese: 南疆; pinyin: Nánjiāng; leeterally: "Southern Xinjiang"). Its northren boondary is the Tian Shan muntain range an its soothren boundary is the Kunlun Muntains on the edge o the Qinghai-Tibet Plateau. The Taklamakan Desert dominates much o the basin. This page wis last eeditit on 4 Mairch 2014, at 13:59.